In the aftermath of the tragedy in Stamford, few people had more guilt to bear than the Robbie Baldwin (aka Speedball aka Penance). Baldwin was dubbed 'the most hated man in America' and it appeared as though Robbie agreed with the public sentiment. In fact, Baldwin's mere presence on the Thunderbolt roster was due in large part to his self-imposed contrition process. Since Robbie was a member voluntarily, he was not required to have the nanite restraint placed into his body. Baldwin's lack of nanites created a whole slew of headaches for his boss Norman Osborn and allowed for tensions to grow between them. Moreover, in the few short weeks that Baldwin was a member of the Thunderbolts he seemed to be making little if any progress in recovering from his immense guilt-complex. 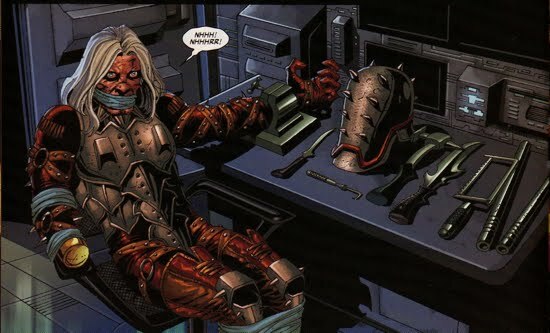 Baldwin's psychological state took a turn for the worse and he managed to drag Osborn down with him in the mini series entitled Penance Relentless #1-5. Dr. David Ableton was the staff psychiatrist brought on to evaluate Baldwin in Penance Relentless #1, and Ableton was responsible for providing his reports to Osborn and Tony Stark. Osborn, who spared no sympathy for Baldwin regarding his actions in Stamford, did not believe Ableton's diagnosis that 'working through the process' was a good sign for Baldwin. Norman was interested only in the pragmatic...how could Baldwin benefit his Thunderbolts team? And if Baldwin was not fit to perform in the field, Osborn wanted him off the team and in a looney bin. But another troubling trait emerged for Baldwin, he has become obsessed with a seemingly random string of numbers. This latest obsession of Baldwin's began driving Osborn nuts (huh, not too hard to do that!) and the director was determined to find out the significance of these numbers. 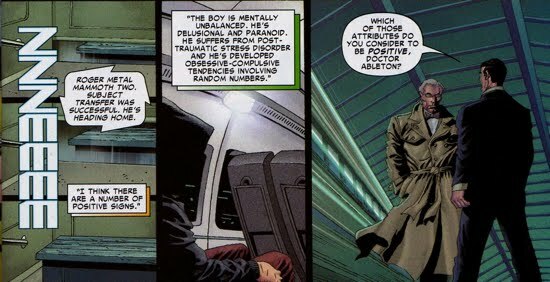 The obvious solution was that the numbers had something to do with Stamford, the question was what and that was what Osborn was looking to find out. Later during a Thunderbolts mission, Penance intentionally disobeyed orders and chased after a group of terrorists who were in possession of a set of nuclear launch codes. Baldwin attacked without the team's backup, allowing one of the terrorists to escape and get word back to his boss, Dr. Doom. Penance then casually handed the codes over to Moonstone and it appeared the mission was complete. At the onset of Penance Relentless #2, Baldwin had gone awol, specifically he left Thunderbolts Mountain for a mansion in southeastern Vermont. 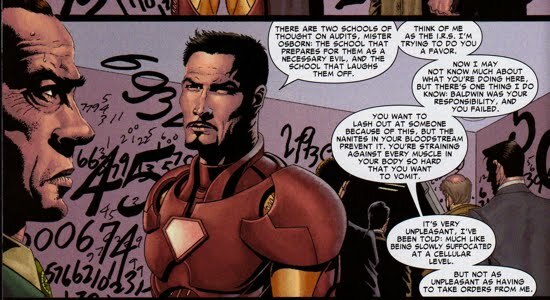 Back at the Thunderbolts headquarters Norman was getting an ear-full from his superior (and antagonist) Tony Stark. Stark flat-out blamed Osborn for Baldwin's disappearance and Norman's only retort was that Baldwin should have had the nanite restraint system placed inside him in order to guarantee his compliance. After some bickering between the two old acquaintances, Stark decided to needle Osborn and test the nanite restraint system inside Osborn. Stark had Osborn outmatched because Norman was forced, with painful restraint from the nanites in his body, to control his urge to kill someone (namely Stark). Stark likened it to suffocation at a cellular level. Before leaving, Stark gave Osborn one final directive: he had three days to cooperate with Stark's investigation and to help find Baldwin. Soon after, Osborn was briefed regarding Baldwin's exploits from his assistant Miss Thompson. She informed her boss that Baldwin had been hacking into secure Thunderbolt databases and stealing everything from social security numbers and tax records to potential superhuman targets and key tactical information. As Osborn popped pills to help control his mood, he and his assistant eventually deduced that Baldwin was looking for information from the Witness Protection Program. Specifically, Baldwin had accessed the file on the registered superhuman The Robot Master (aka Mendel Stromm). Of course, Osborn and Mendel share a rich history. The mansion in Vermont that Baldwin had visited belonged to Stromm, but before Osborn could come up with a plan to stop Baldwin, Stark intervened. Iron Man, flanked by S.H.I.E.L.D. agents, hastily squashed Osborn's accessing of government databases and pulled rank on him to force Osborn to share what he'd discovered. But Osborn proved insubordinate and did not help Stark, so Osborn was forced to remain in his quarters. 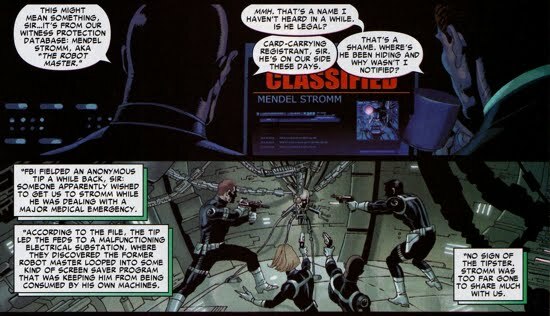 Eventually Osborn's Thunderbolt agent told Stark about Stromm and Stark was convinced that Osborn sent Penance out to kill Stromm. Stark theory was inaccurate but grounded in the fact that Osborn had tried to kill Stromm in the past. Meanwhile at Stromm's private residence, Penance made quick work of the security robots and confronted the former Robot Master face-to-face. After relieving Stromm of more than $8.5 million, Baldwin had another need for him. He handed Stromm a cd with the nuclear launch codes (the ones which he had supposedly handed over to Moonstone after their mission in Baltimore) and he demanded Stromm to activate them! Wolverine attempted to stop Penance's nuclear attack in Penance Relentless #3. After a fight with Wolverine, Penance revealed that the nuclear launch was just a distraction to get the Thunderbolts to intervene. After his team arrived on the scence, Penance stole the team's aircraft, The Falcon, and made way to Latveria to find Nitro (the villain responsible for the Stamford tragedy). Due to the potential severity of Baldwin's actions, Stark called in the big guns (in the form of Reid Richards and the Fantastic Four) in Penance Relentless #4. Osborn, now heavily sedated from the sodium pentathol given to him by Stark, took the time to enjoy the scenery. 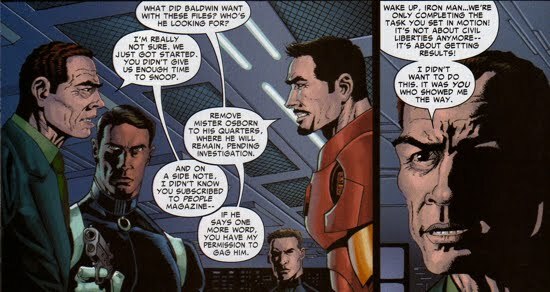 Eventually Stark forced Osborn to share as much information regarding the Thunderbolt's Falcon, which Baldwin had recently stole. With all the truth-serum coursing through his system, Norman could not help but tell Stark how he really felt about him as he struggled to mutter "One day...I'll kill you...". Despite pleading from Stark and the Fantastic Four, Baldwin continued with his attack on Latveria, in search of Nitro. Whilst in Latveria, Penance fought Doom to a forced stale-mate and the totalitarian leader appeared to be outwitted by Baldwin's plan. The two forge an uneasy truce and Dr. Doom allowed Penance access to Nitro's prison cell. The story concluded in Penance Relentless #5, as Baldwin stomped Nitro mercilessly in his Latverian prison cell. During the beating, Penance explained significance behind the numbers he was memorizing. It basically accounted for a mathematical function of the number days since the tragedy (153), the number victims claimed in the tragedy (612), and the atomic weight of nitrogen (14.0067, a constituent of nitroglycerin). He then strapped Nitro into his Penance suit (which was fitted with 612 spikes for the Stamford victims) and sent him on his way back into the U.S. and Federal custody. Before returning to the Thunderbolts headquarters, Baldwin made one last stop in Stamford and anonymously donated the stolen $8.5 million to the over-budget project dedicated to memorializing the victims of Stamford. Penance was beginning to make progress toward dealing with his guilt.